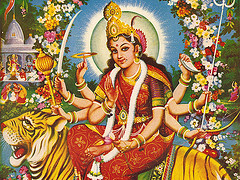 Durga Ashtami as the name suggests is the eighth (Ashtami) day of the waxing phase of moon in the month of Aswayuja. 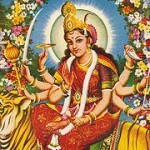 Durga Ashtami is celebrated on Aswayuja sukla paksha Ashtami. Durga Ashtami is celebrated on the eighth day of Sharad Navaratri festival.Durga Ashtami in this year will be celebrated on Sunday , 23rd October , 2050. Durga, a Sanskrit word, means Undefeatable. Special prayers are offered to Goddess Durga on Durga Ashtami. It is a popular legend that Goddess kali and 64 Yoginis have emerged from the forehead of Goddess Durga on Durga Ashtami. Goddess Kali killed the demons Chanda, Munda and Raktha Beeja on Durga Ashtami day. The other name of Durga Ashtami is Veera Ashtami. On Veera Ashtami or Durga Ashtami there exists a custom of worshipping the weapons of Goddess Durga. Maha Ashtami is the other name of Durga Ashtami and worshipping of Goddess Kali on Maha Ashtami is a ritual in some regions.